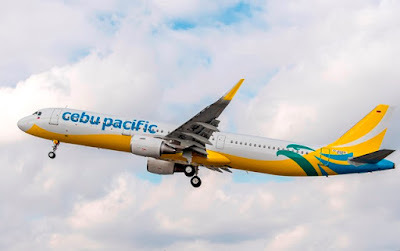 Aviation Updates Philippines - The Philippines' leading carrier, Cebu Pacific (PSE: CEB), receives the first of its 39 A321 aircraft—ushering the entry of a new Airbus model into its fleet. The Airbus A321 is an efficient single-aisle jetliner, the longest and widest among all single-aisle aircraft. LIFT OFF. Cebu Pacific's newest Airbus A321 fleet features 230 Recaro seats with in-seat USB charging. It will enter into service on April 1 from Manila to General Santos. Photo by Airbus. While it can accommodate more seats and cargo, the A321 also provides enhanced passenger comfort. The first seven A321 deliveries of Cebu Pacific are composed of the A321CEO (Current Engine Option) variants, with the next tranche of A321CEO deliveries scheduled in the coming months. Aside from seven A321CEOs, Cebu Pacific has an existing order of 32 Airbus A321NEO (New Engine Option) aircraft), deliveries of which are expected to start by late-2018 until 2022. The A321CEOs of Cebu Pacific boasts of seats made be world-renowned seat manufacturer Recaro. The seats are ergonomically designed, with an angled backrest. Its innovative design allows for more distance and legroom between seat rows. The new seats are 40% also lighter than conventional economy-class seat models. Coupled with increased cabin space, the A321CEOs of Cebu Pacific can easily accommodate 50 additional seats, bringing total passenger capacity to 230. The additional seating capacity will help further lower unit seat costs enabling CEB to pass on the benefits through lower fares to its customers. The new aircraft is also equipped with USB slots so passengers may charge their devices inflight, allowing more Juans to bring their own source of entertainment onboard, worry-free. The new aircraft supports Cebu Pacific's expansion plans across the region, further boosting a network that now spans over 100 routes on 37 domestic and 26 international destinations. Cebu Pacific's now 62-fleet is one of the most modern in the world, comprised of 1 Airbus A321ceo, 36 Airbus A320, 8 Airbus A330, 8 ATR 72-500, and 9 ATR 72-600.